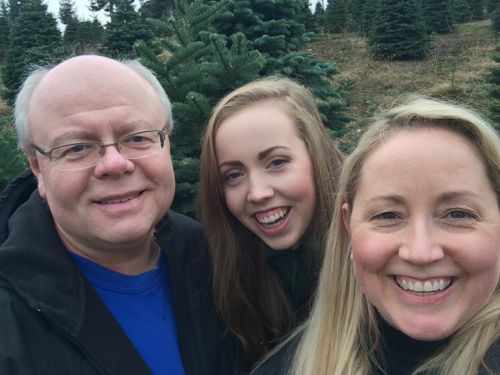 We have a family tradition that the Saturday after Thanksgiving we go hunting for our Christmas tree. This year was a little more difficult because Hubby was scheduled to work, but we made it work. We make an outing of it. We drive to southwest of Portland to Sherwood to visit the Sleighbells. This is only a small portion of their 75 acre farm. 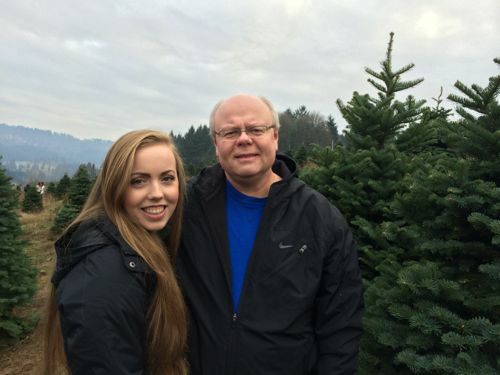 We usually walk around before finding the “perfect” tree for our home. We have specific needs – like there has to be a large “hole”in it. You know, the type of hole that most people don’t want. Well, we have a giant glass Santa ornament that Mindy gave us and we want him to have a place of honor. This year, we found our tree on the hill shown above. While were waiting to the guys who walk around the farm looking for people who need their trees cut down we snapped some pics. I love this one of Hubby and The Offspring. In fact, it’s now my phone’s wallpaper. I found two guys to cut our tree down and they were kind to smile pretty for the camera. After we got home, we trimmed part of the bottom row of branches off so we can place gifts under the tree and then I set out to get the lights on it. 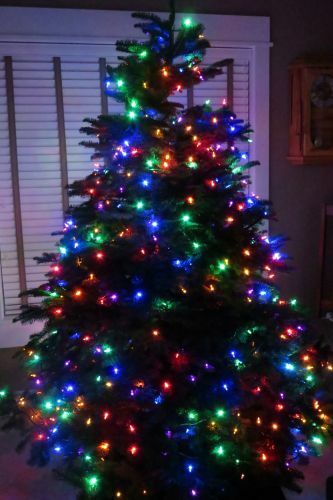 We started using LED lights last year. This is a little under 400 lights. It’s so pretty! Can you see the holes? Those are OK… they will be filled soon! So far, I don’t have the ornaments on the tree yet, but hope to get that done soon. I’ll be sure to post pics when I have it done. 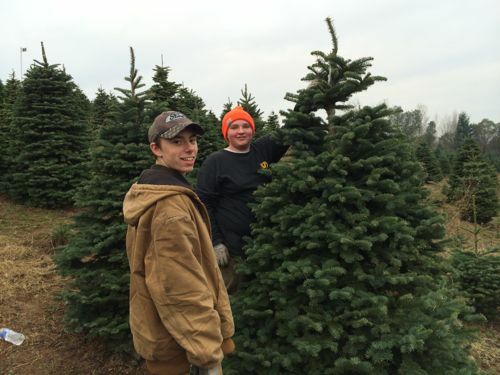 What do you look for when you’re picking out at Christmas tree? Even if it’s artificial, what is it you want in your tree? Uh oh. Did you get it fixed?